Great versatile comfy vest with sleeves/shrug. 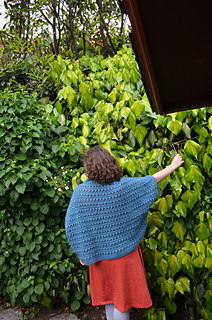 Yarn : I advise you to choose a yarn with enough yardage per skein, so your vest will be lightweight and not heavy. I worked 2 strands together : 1 aran weight yarn + 1 mohair thread. (I needed 800 meters of each yarn) Of course you can also use a super bulky fluffy yarn. The pattern is suitable for beginners.